(no real spoilers here if you've not already seen the Season Three finale) - It was such a sad Sunday! Plus, someone in my Facebook feed blew the whole ending hours before it was on...still a bit bitter about that! C didn't know...and I didn't let on too much...only, shaking my head now and again "it's gonna be sad..." Immediately, after the ending, I actually had to laugh...C's reaction was "are you kidding me?! Those were probably the only two cars in the village and WHAT... were they going 20 mph??" So, you hear that Julian Fellowes? You'll have to do better to impress us...but do stop killing main characters...thanks! After that episode, I did wonder if anyone would buy my cross stitch patterns (they have thankfully). 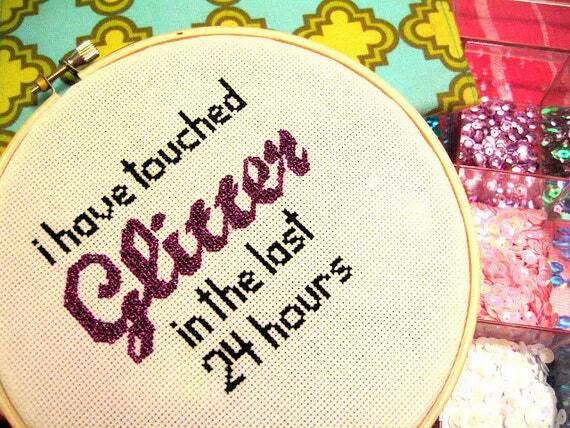 But now is probably as good of time as any to remind everyone of my New Girl TV show cross stitch. Also, an enjoyable show...and no one has died! Other than falling into a deep Downton depression; I spent the last couple days doing some deep purging - my bedroom closet is nearly organized with three large boxes of clothes off to donate! We also cooked a really simple dish of slow cooked black beans and rice. We used purple rice; it's new to me...a Louisiana product that was specially developed to be higher in antioxidants. Its not suppose to taste different but I thought had a slight nutty flavor...which I liked. The only downside seemed to be we could not stop singing Purple Rain while we cooked...and subsequently it stayed stuck in our heads for most of the evening! Purple rice looks lovely before its cooked...but once cooked it looks a bit wormy. Blending it with the black beans was a good call and delish for a cold night! This is my personal blog where I share the concepts behind what I make and design for my retail business, Nest Interiors and my online shop. I focus on textiles and fiber arts...silk-screening, sewing, crochet and embroidery. I am an avid vintage collector, especially linens. I have 2 cats, 3 dogs, infant twins and a very, very patient and supportive spouse. I'm also a survivor of a rare form of cancer, adenoid cystic carcinoma.